Bond and Specialty Insurance, which includes surety, crime, and financial liability businesses which primarily use credit-based underwriting processes, as well as property and casualty products that are predominantly marketed on an international basis. Top: The familiar umbrella logo of the Travelers, used until its spinoff from Citigroup. Bottom: The logo that The St. Paul used prior to the merger with Travelers. The main predecessor companies of The Travelers Companies, Inc. are The St. Paul Companies, Inc. and Travelers Property Casualty Corporation. 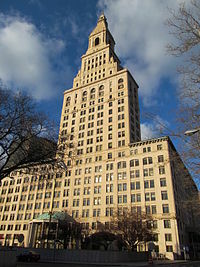 Travelers was founded in 1864 in Hartford. It was founded to provide travel insurance to railroad travelers at a time when travel was far more risky and dangerous than today, hence the name. Along the way it had many industry firsts, including the first automobile policy, the first commercial airline policy, and the first policy for space travel. In 1954 it established the world's first privately owned weather research facility, the Travelers Weather Research Center, the first organization to make weather predictions using probabilities ("20% chance of rain"). By the early 1990s, Travelers was predominantly a general property and casualty insurer that also happened to do some travel insurance on the side, and it quietly exited its original business in 1994. What was left of Travelers' travel insurance business was acquired by three former employees and is now known as Travel Insured International, a Crum and Forster Company. Many of Travelers' ancestor companies, such as St. Paul and USF&G, are technically still around today, and still write policies and accept claims in their own names (under the overarching Travelers brand name). As is typical of most insurers in the United States, Travelers never dissolved the various companies it acquired, but simply made them wholly owned subsidiaries and trained its employees to act on behalf of those subsidiaries. This is a common risk management strategy used by U.S. insurance groups. If any one company in the group gets hit with too many claims, the situation can be easily contained to that one company (which is placed in runoff and allowed to run its policies to completion), while the remainder of the group continues to operate normally. In October 2015, Travelers acquired a majority interest in the property casualty business of its J. Malucelli joint venture in Brazil. J. Malucelli commenced writing property casualty business in 2012. The property casualty business operates under the Travelers brand and focuses on property, general liability, construction and financial insurance products. The business is based in São Paulo. ^ a b Travelers' NYC address = HQ move? ^ a b c d e f "The Travelers Companies, Inc. 2017 Annual Report (Form 10-K)". sec.gov. U.S. Securities and Exchange Commission. January 2018. ^ The Associated Press (2009-06-01). "Travelers and Cisco Replace G.M. and Citi in Dow". The New York Times. ISSN 0362-4331. Retrieved 2017-04-19. ^ Browning, E.S. (2009-06-01). "Travelers, Cisco Replace Citi, GM in Dow". The Wall Street Journal. Retrieved 2017-04-19. ^ Journal, Leslie Scism Staff Reporter of The Wall Street (1998-01-20). "St. Paul to Acquire USF&G In $2.8 Billion Stock Swap". Wall Street Journal. ISSN 0099-9660. Retrieved 2016-12-28. ^ "The St. Paul Travelers Companies, Inc. - Company Profile, Information, Business Description, History, Background Information on The St. Paul Travelers Companies, Inc". www.referenceforbusiness.com. Retrieved 2016-11-13. ^ Moylan, Martin. "Travelers drops the "St. Paul." Will it drop the other shoe?". Retrieved 2016-12-28. ^ a b Primerica Financial Services history, Citigroup. Retrieved March 2, 2007. ^ MetLife Completes Acquisition Of Travelers Life & Annuity, MetLife press release, July 1, 2005. ^ Travelers Property Casualty Corp. Buys Renewal Rights To Commercial and Personal Lines Businesses of Royal & SunAlliance, Travelers Property Casualty Press Release, September 4, 2003. ^ "Travelers Buys Some Royal & SunAlliance Lines". www.propertycasualty360.com. Retrieved 2016-12-28. ^ Treaster, Joseph B. (2003-11-18). "$16 Billion Deal Joins St. Paul and Travelers". The New York Times. ISSN 0362-4331. Retrieved 2016-12-28. ^ "The St. Paul Travelers Companies, Inc. : Travelers Property Casualty Corp.'s Class A and Class B common stock Securities Litigation". Stanford Law School. Retrieved April 19, 2017. ^ "Securities Class Action Clearinghouse: Case Page". securities.stanford.edu. Retrieved 2016-12-28. ^ Riley, Clint (2007-02-14). "Citigroup Sells Red Umbrella Logo to St. Paul". Wall Street Journal. ISSN 0099-9660. Retrieved 2016-12-28. ^ Merced, Michael J. De La (2007-02-13). "Citigroup folds its umbrella logo - Business - International Herald Tribune". The New York Times. ISSN 0362-4331. Retrieved 2016-12-28. ^ "St. Paul Travelers To Change Company Name To Travelers And Bring Back Iconic Red Umbrella". Business Wire. 13 February 2007. Retrieved 2 September 2018. ^ Mullman, Jeremy (February 13, 2007). "Travelers Reunites With Red Umbrella". Advertising Age. Retrieved April 19, 2017. ^ "Travelers Taps Into Brazil With Joint Venture". Forbes. November 4, 2010. Retrieved 2016-08-15. ^ "Travelers Eyes Canada Growth with $1.1B Acquisition of The Dominion". Insurance Journal. June 10, 2013. Retrieved 2016-08-15. ^ "Travelers completes acquisition of The Dominion". Canadian Underwriter. November 1, 2013. Retrieved 2016-08-15. ^ "Travelers Dives into Colombia Through Brazilian Joint Venture". Carrier Management. 10 December 2014. Retrieved 2 September 2018. ^ "Travelers Buys Majority Stake in J. Malucelli to Grow in Brazil". Zacks.com. October 2, 2015. Retrieved 2016-08-18. ^ "Travelers makes major commitment in Brazil". Hartford Business Journal. October 5, 2015. Retrieved 2016-07-17. ^ "Travelers buys Simply Business for £400m in digital push". Financial Times. March 13, 2017. Retrieved March 13, 2017. ^ "Travelers to Buy UK-Based Simply Business for $490M". Insurance Journal. Retrieved March 13, 2017. ^ "Travelers shores up online distribution with U.K. purchase". Digital Insurance. Retrieved March 14, 2017. ^ "Travelers Cos. - Fortune 500". Fortune. Retrieved 2018-06-22. ^ Browning, E. S. (2009-06-02). "Travelers, Cisco Replace Citi, GM in Dow". Wall Street Journal. ISSN 0099-9660. Retrieved 2018-10-17. ^ "Read the Travelers Statement on Alan Schnitzer and Jay Fishman". The Wall Street Journal. August 4, 2015. ^ "Travelers Completes Acquisition of UK-Based Simply Business". Retrieved 2017-08-04. ^ Garrison-Sprenger, Nicole (January 6, 2008). "Travelers to pay $77 million to settle merger-related suit". Pioneer Press. Retrieved April 19, 2017. ^ "Insurer Agrees To Halt Contingent Commissions - Law360". www.law360.com. Retrieved 2016-12-28. ^ "Travelers to Pay $6 Million, Ending Inquiry on Brokers' Fees". The New York Times. January 1, 2008. ^ "UPDATE 1-Travelers to settle compensation case with states". Reuters. December 31, 2007. ^ "Travelers Settles With States Over Brokers' Contingent Commissions". Insurance Journal. 2008-01-13. Retrieved 2017-04-19. ^ "UPDATE 1-Travelers sues NFL over brain injury lawsuits". Reuters. August 22, 2012. Retrieved 2012-09-15. ^ "Travelers Sues NFL Over Ex-Players' Brain Injury Lawsuits - Law360". www.law360.com. Retrieved 2016-12-28. ^ Stern, Zack (25 September 2006). "Real-life Katamari in Travelers Insurance ad". engadget. Retrieved 2 September 2018. ^ Stern, Zack (28 September 2006). "Travelers ad imitating Katamari: just coincidence". engadget. Retrieved 2 September 2018. ^ Mathews, Jay (September 24, 1993). "The Making of a Financial Services Empire". Washington Post. Retrieved 2018-09-02. ^ Levick, Diane (1994-03-27). "No Gain Without Pain At Travelers". Hartford Courant. Retrieved 2018-09-02. ^ Scism, Erik Holm and Leslie. "New Travelers CEO Has Family Ties". WSJ. Retrieved 2016-12-28. ^ "Robert I. Lipp J.D. : Executive Profile & Biography - Bloomberg". www.bloomberg.com. Retrieved 2016-12-28. ^ Edelstein, Jeff (May 17, 2010). "Look Who's Talking: Samuel J. Plumeri Jr". The Trentonian News. The Trentonian News. Retrieved July 15, 2010. ^ Bianco, Anthony (March 30, 1998). "Joe Plumeri: The Apostle of Life Insurance". Bloomberg. Business Week. Retrieved July 15, 2010. ^ "Joseph J. Plumeri Profile - Forbes.com". 2010-09-30. Archived from the original on 2010-09-30. Retrieved 2016-12-28. ^ "Newspaper Archive". Nl.newsbank.com. 1994-10-23. Retrieved 2010-07-30. ^ Lubanko, Matthew (1998-03-12). "Travelers Chairman Reaps $227 Million". Hartford Courant. Retrieved 2018-09-02. ^ Singer, Natasha (2016-08-25). "Jay Fishman, Who Led Travelers Safely Through the Financial Crisis, Dies at 63". New York Times. Retrieved 2018-09-02.